As much as I love making yeast breads and other good stuff that are yeast raised like sticky buns , my first love will probably always be cornbread .There is just something so homey about a good wedge of cornbread, be it plain or doctored up, as this version is. You can eat it by itself; and contrary to popular belief, you really should be able to eat it plain, without soaking it in something to relieve dryness. If it’s that dry, you did something wrong when baking it. Preheat the oven to 400. Butter a 9 inch cast iron pan or a 9 inch square baking pan. Then, brown your butter- place the butter in a small pot. Melt it over medium high heat, swirling it frequently. Let it keep cooking until it turns a nice golden brown, then immediately pour it into a measuring cup or bowl to cool a bit while you work on the rest of the recipe. In a large bowl, whisk to combine the flour, cornmeal, baking powder and salt. In another bowl, combine the maple sugar, cream, milk, honey and browned butter. Whisk well. Add in the eggs (and maple flavoring if that’s what you’re using) and whisk well. Pour the wet ingredients into the dry ingredients and use a rubber spatula to stir just until barely combined. 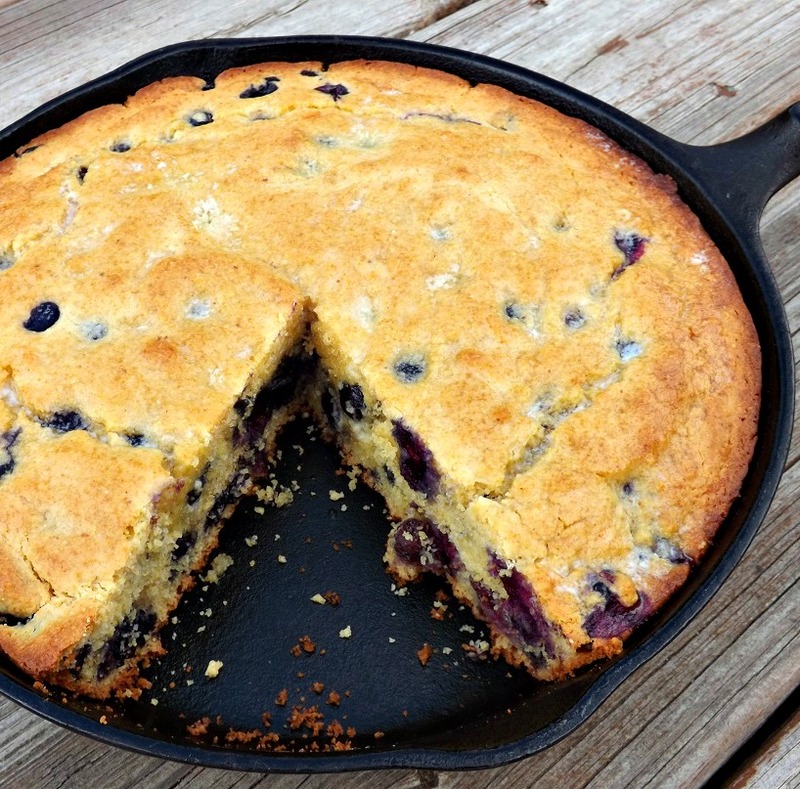 gently fold in the blueberries then pour the batter into the prepared pan. Bake at 400 until the top is golden brown and a wooden skewer inserted in the center comes out clean, about 20 to 25 minutes. 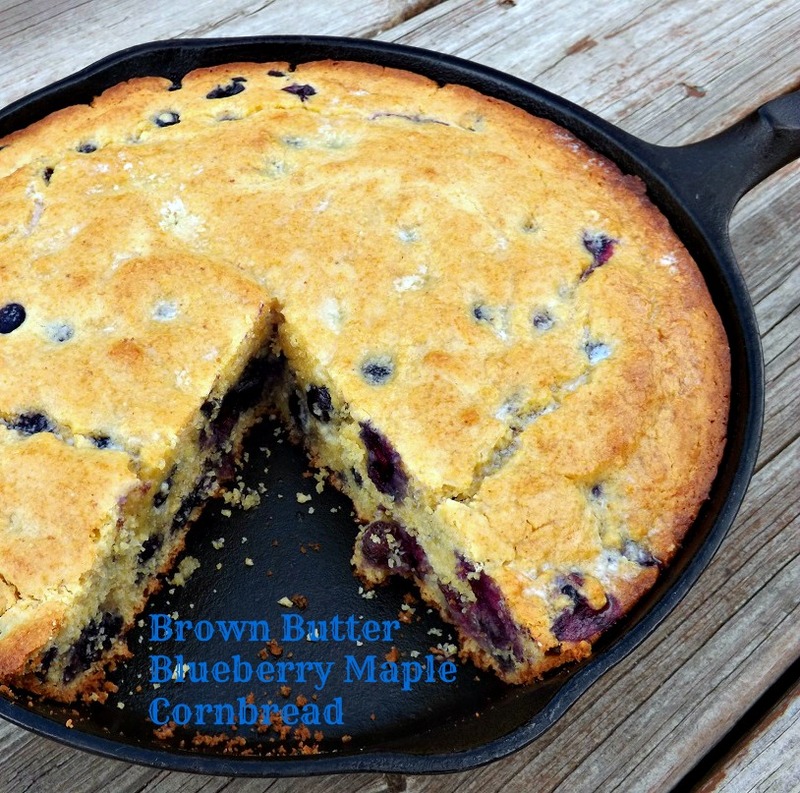 This entry was posted in Berries, Breakfast, Browned Butter, Corn Bread, Easy, Maple, Vegetarian and tagged blueberry, brown butter, corn bread, easy, maple by Janet. Bookmark the permalink.